Donald Jay Owens, age 78, passed away peacefully Monday, September 19, 2016 at this home after lingering health issues. Don is survived by his daughter Becky Kilpatrick and husband Denny of Corpus Christie, Texas; step-son Will Blocker and wife Lynn of North Bend, Nebraska; and, sister Linda Bailey of Nacogdoches, Texas. He is also survived by six beloved grandchildren, Geoffrey, Lindsey and C-Jay Kilpatrick, Shad Getz, Alesha Wilson and Landry Shrive. He leaves behind eight great grandchildren, Allen, Madison, Paislie, Gentry, Maddie, Carter, Grady and Marie. In addition, he is survived by a multitude of extended family who will greatly miss him. Don is preceded in death by the love of his life, his wife Norma and by their precious daughter Cindy. 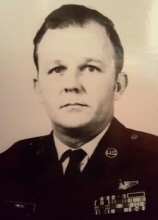 Born and raised in Blackwell, the son of Jay and Winifred Owens, Don was a veteran of the United States Armed Forces. He entered the Air Force the day he graduated from Blackwell High School and made the military his career. He became a Gunnery Sergeant flying B-52 bombers through his military service. Don loved the military life. He loved the men he served with and he loved his country unwaveringly. After retirement from the military, Don moved back to Blackwell to be of assistance to his aging parents and reconnect with extended family. For his family, he was a port in the storm. He could always be counted on to help wherever he could and made himself available whenever needed. He was generous with both his resources and his time, giving to his family as he had given to his nation. Don Owens was rich in family and friends. His life impacted all those who knew him, even more in his later years than in his earlier. He is loved by those who knew him, friend or family, and he will be missed here on earth. In heaven, Don is reunited with all those he loved so much who have gone before and is celebrating their embrace. His family is greatly comforted in the knowledge that, in Christ, they will one day join him in one great family reunion. Visitation is set for Friday, September 23, at Trout Funeral Home in Blackwell. A graveside service is scheduled for Saturday, September 24, at 2pm at the Blackwell Cemetery. Memorial Donations may be made in Don’s name to Wounded Warrior Project. To send flowers or a remembrance gift to the family of Donald Owens, please visit our Tribute Store. "Email Address" would like to share the life celebration of Donald Owens. Click on the "link" to go to share a favorite memory or leave a condolence message for the family.